What A Load Of CRAB! 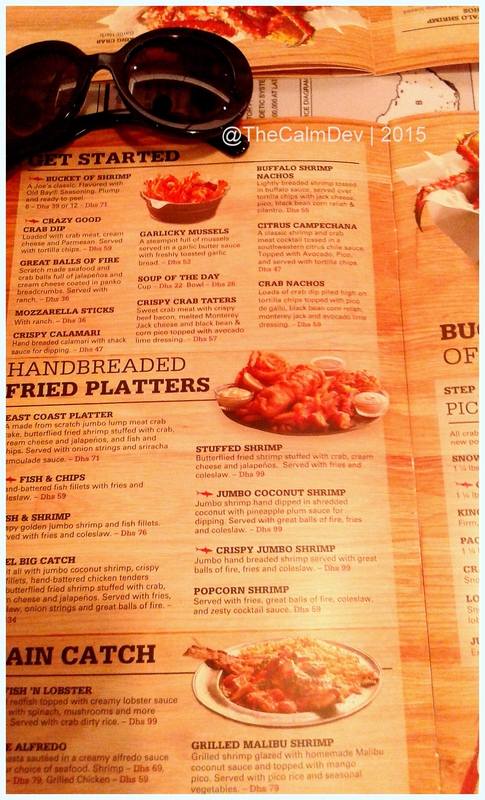 Home to the best variety of crustaceans, Joe’s Crab Shack has done very well for themselves in the US. 130 across the entire continent is not a feeble feat. And then, for the 131st, they decided to come to the other side of Atlantic and weigh anchor in Dubai. And, are we not happy! JCS opens in the Dubai Mall, Level 2, right next to the Dubai Aquarium under the aegis of F&B stalwart Sahej Bin Lahej. It is a happy place with a warm and friendly staff, who know their crabs and sharks. Ask staff for recommendations. And you will end up with something that you will really like. 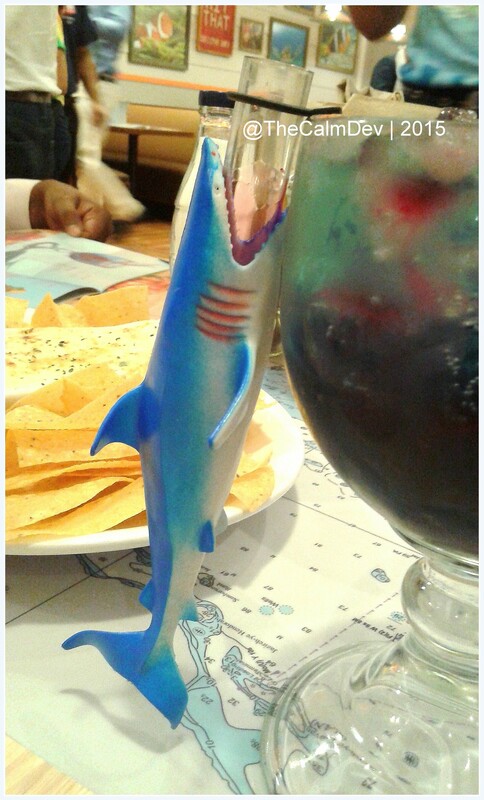 For example, this NatGeo-meets-nightclub drink called Shark Bite. 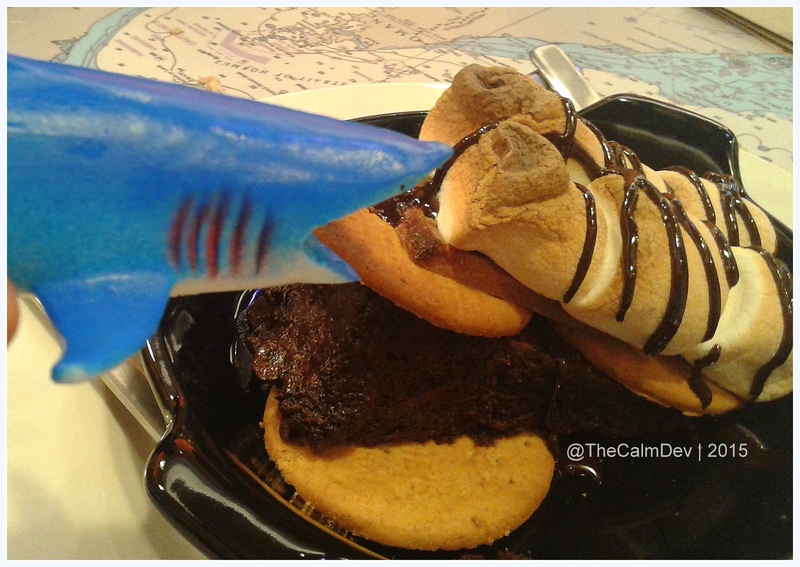 Comes with an angry shark on the side that spills ‘blood’ on the blue waters of your drink. Creative. There is no sarcasm in this; it is creative. And you get to take the shark home. Monogamous ones can try the Pina Colada and then wait to be surprised with the presentation. No spoilers here. Go there and see it for yourself. The starters can get you soaked in a ‘mer’-ry mood. Try the Great Balls of Fire if you fancy hot and spicy or ask for the Good Old Crab Dip – toasty tacos served with a creamy baked crab dip with pieces of celery to add freshness. This is one starter that could feature in the mains, and I wouldn’t complain. Order 2 if you are a table for 4. Do it. 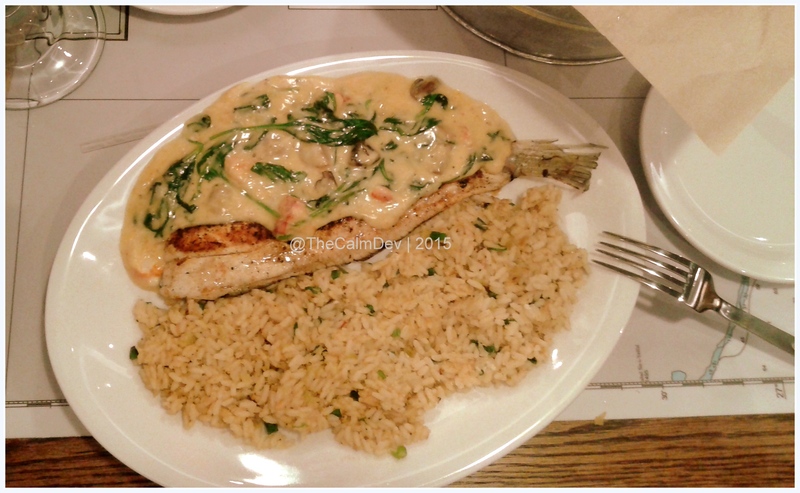 For the mains, I went straight for the grilled red snapper in a creamy spinach and lobster sauce! How fancy does that sound! it came with some crab-infused rice. Pretty much fisherman’s food, minus the cream. The red snapper was fresh. Thank heavens, there is no over-harvesting of hammours here. 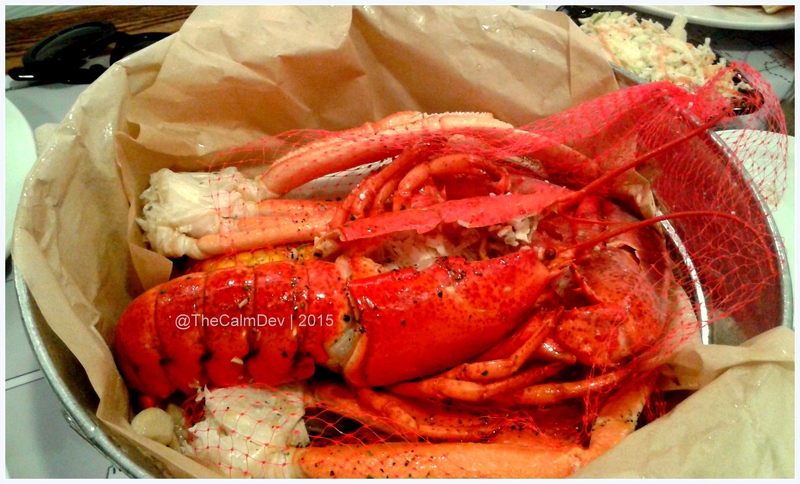 If you are in the messy mood, go straight for your bucket of crabs or lobsters. These king crabs or stone crabs are shipped straight from the US; reason being that they are not native to the Arabian Sea ecosystem. In fact, all the sea food is shipped regularly from America and made pan-fresh and served. While your bucket reaches you, you will be readied for battle. An apron will be draped, gloves donned and cracker and zipper handed over as weapons of choice. If you are a new soldier, ask the staff for a happy demonstration. And then you are ready to attack the orange-coloured crustacean army! If you are brave enough for desert, try this camp-fire compilation of a chocolate cake slice over digestive biscuits, layered with a bar of Hershey’s chocolate, with marshmallows on top and then torched lightly for colour and effect. 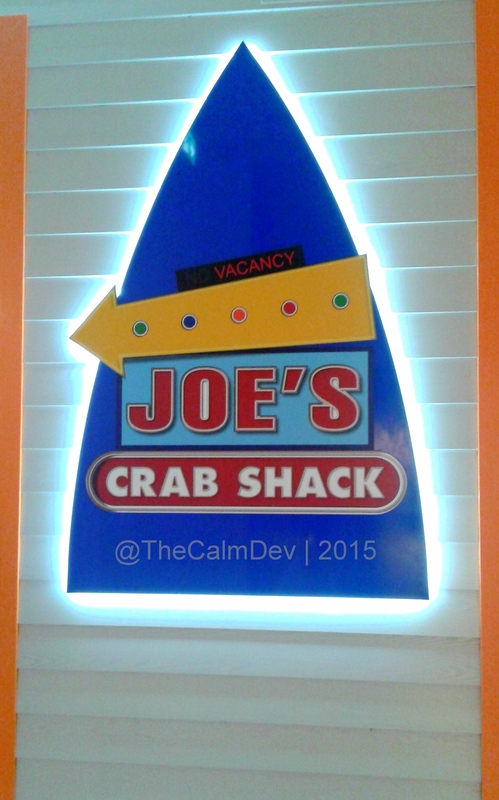 Just one thing, Joe’s Crab Shack changed my childhood memories of loving Sebastian the crab, forever. Now I like crabs more! 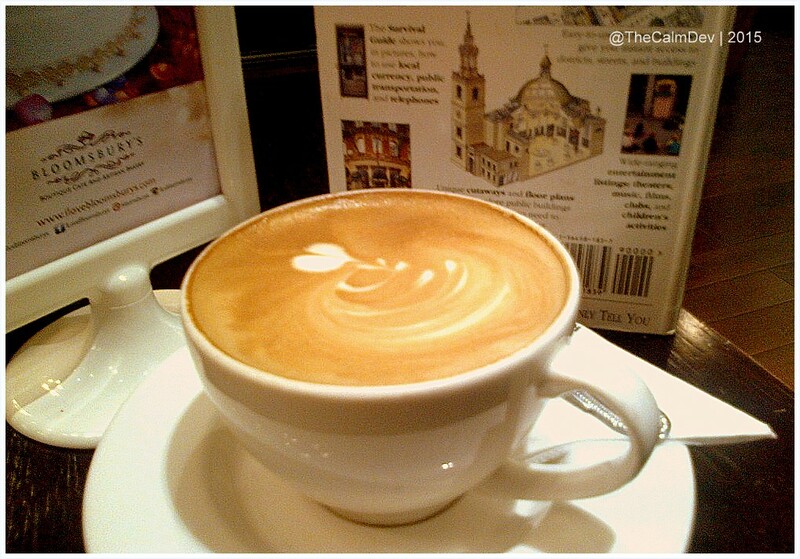 Bloomsbury’s Artisan Bakery – for your cup of joy! Ooh it is a tough task to get me to Dubai Mall; and that too on a Friday. Truth be told, I don’t remember where I came from and where I need to go. As a man who prides his in-built GPS sense, there is a stereo-typical shame in admitting that I am foxed by the ‘exit’ signage. Besides, on a Friday, Dubai Mall is a test in negotiating skills more than I have used all week. 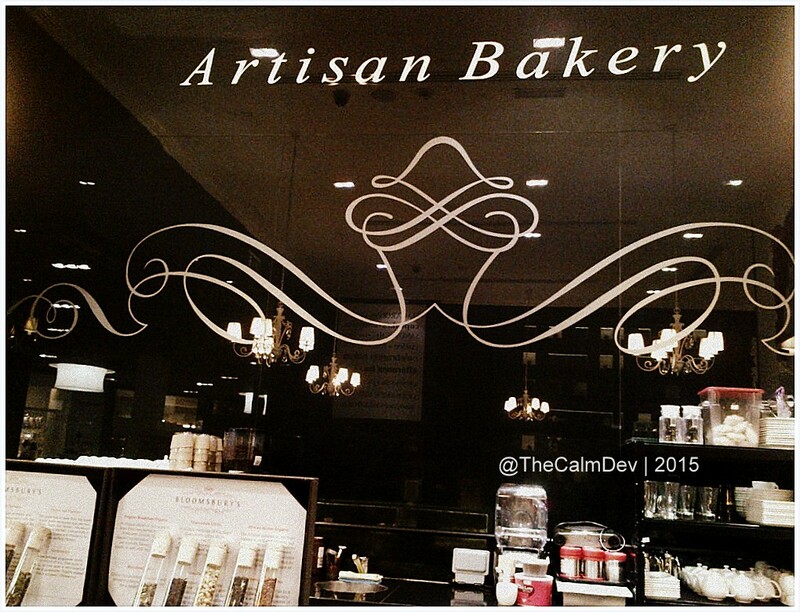 I accepted to visit Bloomsbury’s Artisan Bakery in Dubai Mall rather gingerly. I didn’t fancy cup-cakes either. And there I found myself driving to Dubai Mall with my wife and toddler in tow for a promised cosy and lazy breakfast. We managed to get to the store which is located twixt the fountain and Wafi Gourmet. Bloomsbury’s – the Boutique Café and Artisan bakery is a home-grown and chef driven concept with all recipes created from scratch using the finest ingredients available seasonally. From cupcakes, confectioneries, the famous high tea, and afternoon tea, Bloomsbury’s serve a fine selection of tea from all over the world. While I was waiting to be served, I was sniffing around their fancy tea test tubes containing some fine mix of teas – some refreshing and some with a vigorous flavor. However, I settled for a cup of strong coffee, since that is my favourite poison. 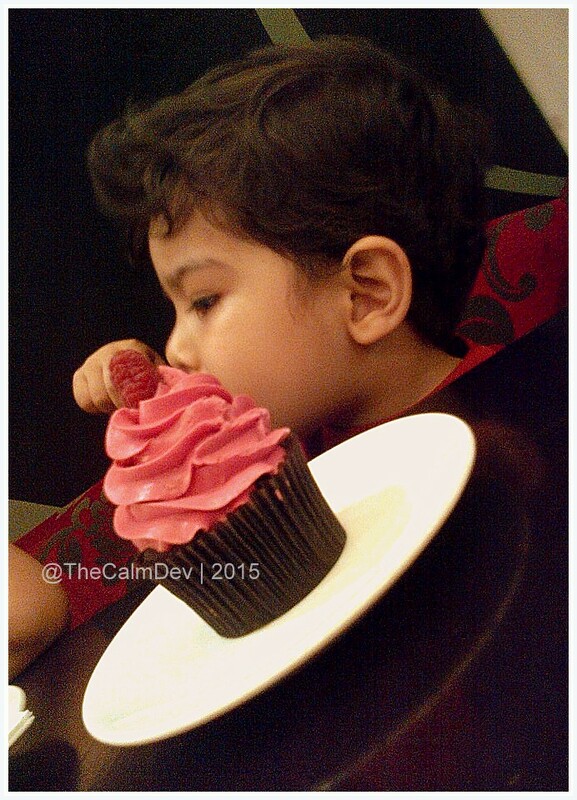 My son found the quaint café quite interesting, more so as he leafed through a book on London while the smiling hostess put a strawberry cupcake in front of him and a ‘red velvet’ in front of us. The clever boy that he is, he didn’t wait any time in celebrating his cheat-day by digging into the smooth icing on the cupcake. I slowly advanced towards the ‘red velvet’ with some dramatic music in my head – cupcakes give you a sugar rush with the icing that will last you a rugby match – and when I spooned in the first swirl of the icing, I was blown over! Soft, creamy, clearly fresh cream cheese and with the sweetness fine-tuned to perfection! OK, then Bloomsbury’s – you are winning me over! I walked over to the display to run a look at the motley collection of cupcakes that flaunt over 30 different flavours. The friendly store manager Mayank pointed out that the café has a unique rating system for all their products. That way, only the tops ‘stars’ are served to Bloomsbury’s patrons. 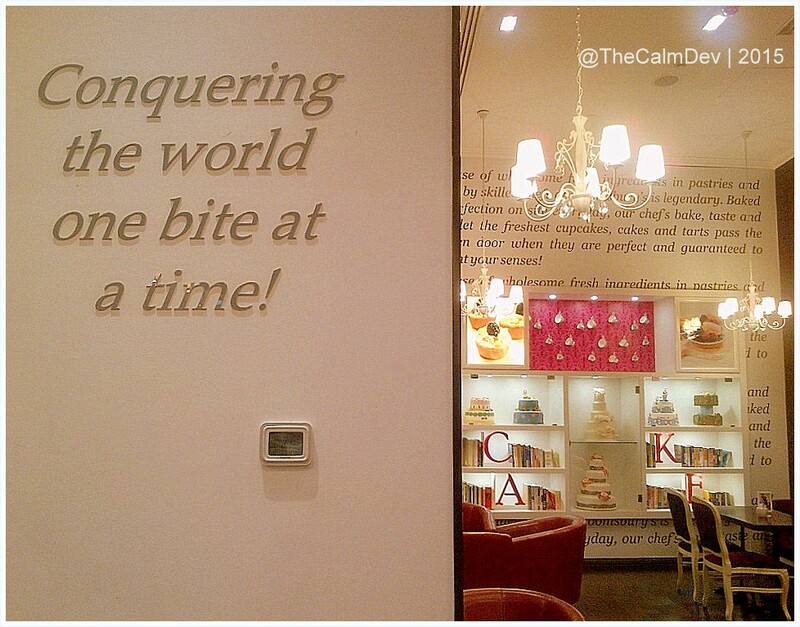 Suddenly, I realized the pressure of being a cupcake! 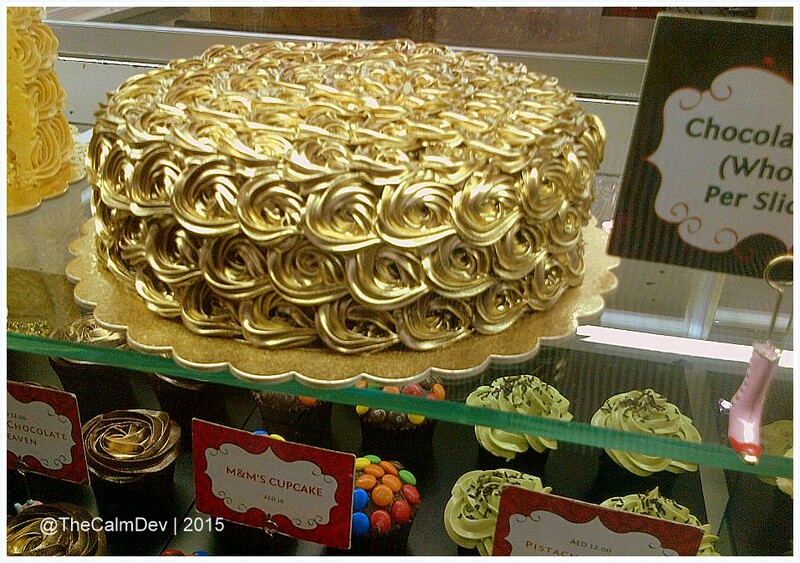 I noticed this very artistic, golden hued chocolate fudge cake. It is Bloomsbury’s big ticket item that has seen unprecedented popularity thanks to its shape, size, texture and hue. Have a special occasion in mind? Book this good-looking baby. And there’s more, Bloomsbury’s also creates bespoke cakes / cupcakes for special days like birthdays, weddings, bridal showers, baby showers et al. 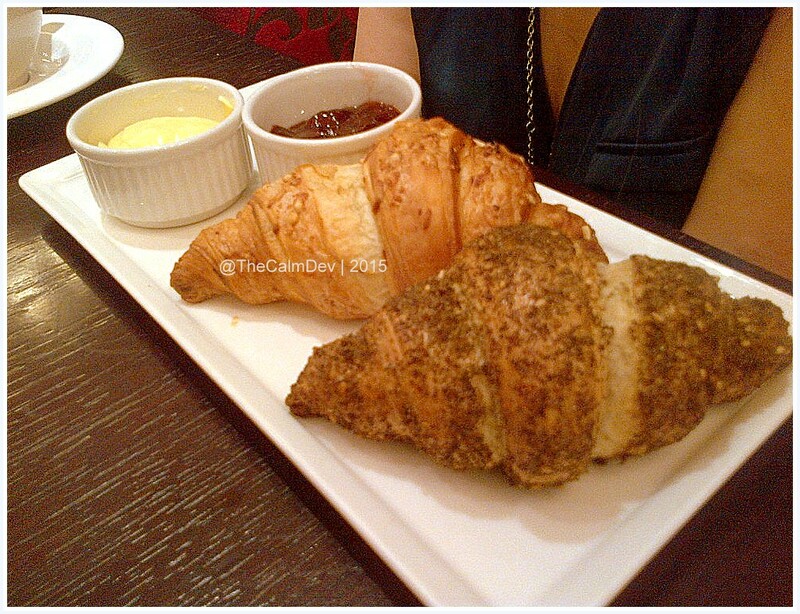 I sat down for my breakfast that consisted of oven-fresh flavoured croissant and coffee. Wife and I cooed over the zaa’tar croissant and the cheese variant. They were flaky, perfectly baked with the heat permeating to the deepest inner folds of flour. This is croissant could have you go silent for some time. Set your Bloomsbury’s date at the Dubai Mall, near Wafi Gourmet with the café open from 10AM till midnight on weekdays and extending an hour on weekends. In Abu Dhabi, find them at Al Wahda Mall, Mushrif Mall and Y Tower Building. In case you fancy a drive up to Ras Al Khaimah, look for Bloomsbury’s at the newly opened RAK Mall. Fresh ingredients, aesthetic and artistic, and made hot off the oven, daily, Bloomsbury’s Artisan Bakery is that perfect place to sit with a book or watch shoppers walk past with a hot, buttered croissant or decadent cupcake and coffee. There is something mysterious about the broccoli. The effect begins with its spelling. It sounds like new villain in town! It could sound like a new Italian music composer! Some may build a connection with secret agent 007! But there is a connection that IZ, the authentic tandoori restaurant in Grand Hyatt, has established and an irrefutably delicious connection at that! And that is their signature dish – grilled broccoli! IZ is perhaps Grand Hyatt, Garhoud, Dubai’s best kept secret. They serve the most delectable north Indian fare without the sensational fanfare that other restaurants deploy. I love the setting – partially inside, surrounded in dark woody hues and outside seating beside a roaring fountain. Why I say ‘best kept secret’ is because of its location. You could miss it, unless you can smell the ‘tandoori’ air just around it. So, sitting down for a lunch meeting at IZ, was a very happy and special moment. Conversations alternated between food to business. The very pleasant PR Manager Leenu graciously hosted me and my colleague as we sat to discuss the imminent launch of IZ Brunch. And of all things included, she presented me with a plate of grilled broccoli. I brandished my fork and knife and dumped 2 florets on my plate. I know broccoli. I know how they taste. I use them myself, regularly. I cut down a decent part of the floret and popped it in my mouth. And after that, my vocabulary got drastically changed. So did our conversation! I havent tasted broccoli that sensational! Perfectly cooked. Tender yet crunchy. And from deep within, came a buttery taste that complimented the florets so beautifully. Broccoli overtook the table. Broccoli beat the chicken and salmon. Shamelessly, I pulled in the last floret on the plate, lest it gets taken away by the smiling and efficient IZ staff. I requested Leenu to call the chef over. Chef Aftab is a very humble man. I conveyed that if anybody can make broccoli taste this sensational, then that person must be a very capable chef! I have also managed to convince them to teach me how to grill broccoli to perfection and part with the recipe. And I will not be able to share it on this blog. Order the grilled broccoli. You will learn to love your green veggies. Order the grilled broccoli. You will revel in the taste. Order the grilled broccoli. They are on the brunch menu. Yayy! Order the grilled broccoli. They can only be beaten by their signature mushrooms. Order the grilled broccoli. I strongly recommend it. PS: I am negotiating with Grand staff and Leenu to rename the broccoli as Killer Brocs! I am putting my weight to that! 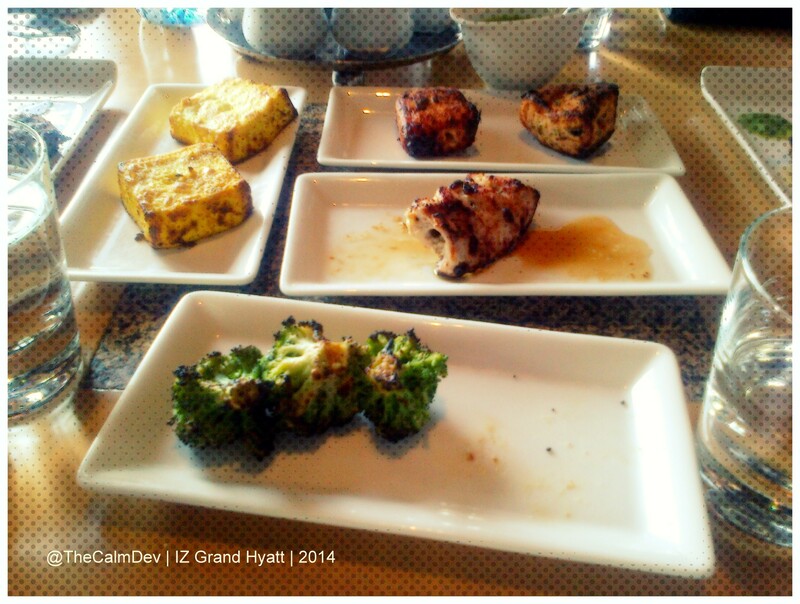 Brunch at IZ the tandoori restaurant at Grand Hyatt launches early May 2014. Watch this space for more. I am not really in favour of restaurants with live music. I have my reasons for not liking the mix of hot food and live music. First and perhaps, the foremost, I feel that music is being degraded by presenting it to a bunch of people who are more interested in what is on their plates than on the singer’s lips. There is an automatic curtain that we draw in our heads trying to separate the live performers and food. Music, when presented live, requires some amount of attention. Respect for the craft and the craftsman completely flies out of the window when one walks into a ‘restaurant with live music’. I start detesting the idea when fine dining restaurants have live performers. How am I supposed to concentrate on the food, then? Second, if I need to have entertainment in front of my eyes while I eat, I usually switch on the TV. At least I can change channels as opposed to stuck with singers who I might not fancy. I do not see the point of having singers who put on a show as if they were applying for American Idol. Singing while people eat will not guarantee music loving audiences. It is a conversation killer. How am I supposed to talk to my co-chair when some Johnny or Jenny is trying to wrench all their emotions in a song that is blaring across the restaurant? Excuse me, I want to talk. I want to discuss the food. I want to share how my day went. I want to know what is happening in my friend’s life. I do not want to practise sign language with a knife and fork in hand and look like a complete retard. Pardon my French. Besides, the quality of music (or sometimes dance) is not good, most times. It takes away from the taste of my plate when the music that is dished out is below standard. Like Instagram has made photographers out of everybody, karaoke has made everybody singers. I recently walked into a karaoke restaurant, not knowing that it was a karaoke night, and I cursed my decision all throughout the evening. As if the restaurant singers were not enough, there were other customers, who decided to sing a love-lorn sing in between starters and main course. You have no idea, what I went through that night. Does one not find it weird when strange pairs of eyes keep looking at you and your dinner ridden plate for compliments or clappings? Does one not find it weird to eat with somebody looking at you? I do. Neither do I like the idea of customers staring brazenly at the singer (God bless, if you are a woman)! All in all, I find the idea, rather futile and infertile. If music be the food, then play some music softly, like most restaurants do. 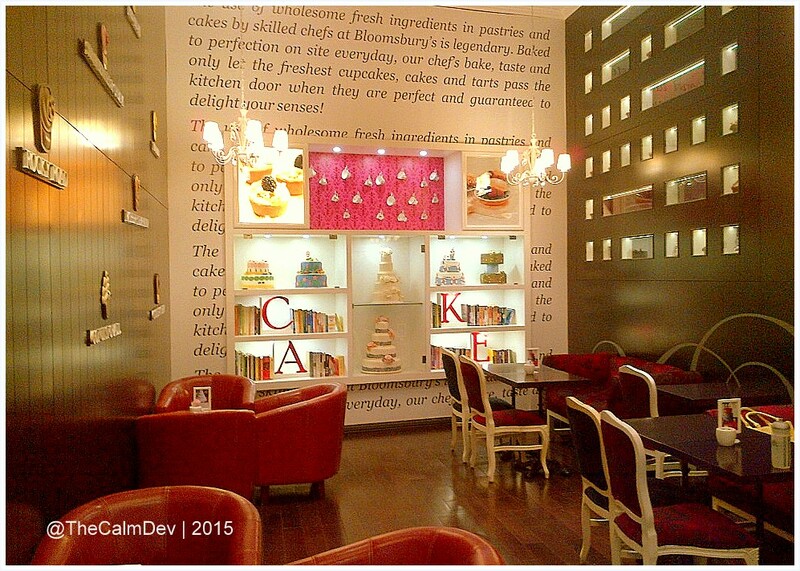 Let there be good conversations and mirth, let people enjoy the food, savour it with their eyes and taste buds. Let the multitudes in the food and beverage industry learn to respect food and music separately. One can be the other’s inspiration but both hold different positions. Let us not take it away from them.